Not sure what makes people think they’re entitled to do this. Caravan turns left on a yellow arrow (turning to a red arrow) even through traffic was completely congested. Sat in intersection because he had nowhere to go. 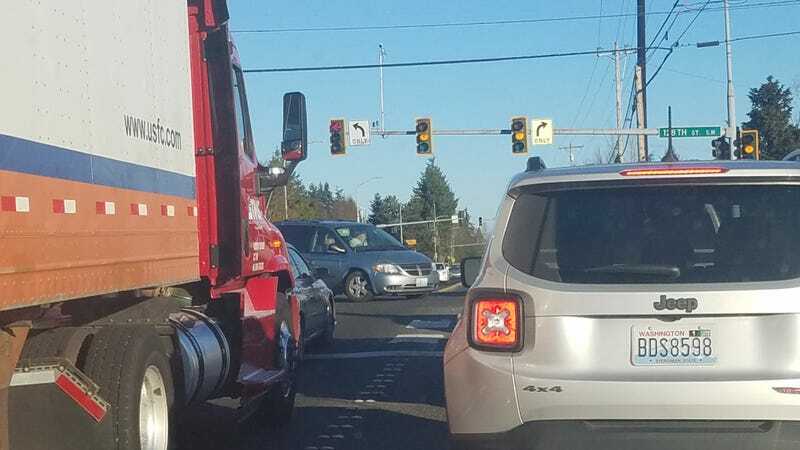 He then sat some more and blocked out our two lanes when we it turned green for us. I see this all the damn time. Literally prevented 3 dozen vehicles from passing through the intersection because he didn’t want to wait 45 more seconds for her next green arrow. His wife also madw a crude gesture at the sedan in front of the semi for honking at them. If you know traffic isn’t moving, then don’t run the yellow light. You are not more important than one single person on this road, and, I daresay, this planet. Well anyway, just another Monday for me.